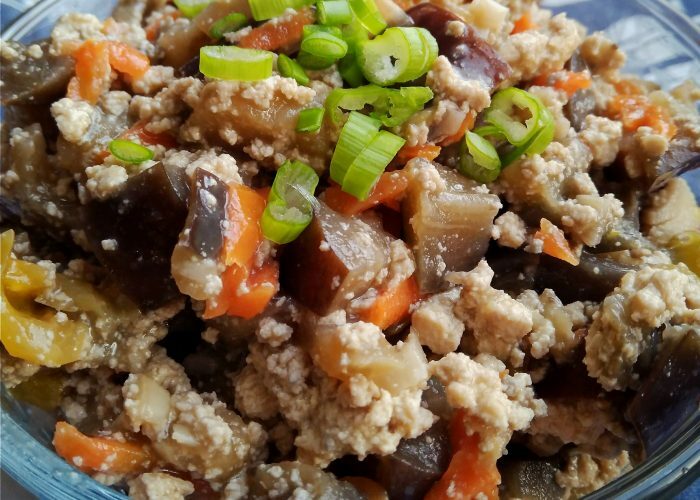 One of our family favorites used to be a certain Asian eggplant minced pork dish that a friend had introduced to me during my college days. We especially loved the dish’s rich garlicky sweet and sour thick glaze. Well, I recently started having a craving for eggplant and for that sauce, so I decided to try my hand at making a plant-based version. It worked and I am delighted to share the quick and simple stir-fry recipe below! The crumbled tofu pieces give a nice texture that resembles minced meat. Pair this dish with the grain of your choice like rice, couscous, quinoa, barley, noodles or gluten-free alternative. This Eggplant Tofu With Garlic Sauce dish can be the main entrée or act as a side dish. I hope you enjoy this Asian-inspired, vegan, egg-free, dairy-free and nut-free dish recipe as much as our household does! A vegan, egg-free, dairy-free, nut-free, Asian-Inspired dish of tofu and eggplant cubes in a garlicky sweet and sour thick glaze. Drain the excess liquid out of half a block of firm (or extra firm) tofu. To do this, sandwich the half tofu block between two pieces of paper towel and two heavy plates for at least 10-15 minutes. Let the water drain out of the tofu to soak the paper towels. Replace the wet paper towels with dry ones at least once during this pressing process. While the tofu is draining, mince the 5 garlic cloves and chop the eggplant up into small cubes (about 1 inch x 1 inch cubes). Put a tablespoon of oil into a heated saucepan on a medium stove heat setting. Add the minced garlic pieces. Once the minced garlic pieces start to sizzle, add in the eggplant cubes and stir the eggplant cubes around so all get coated with the oil (the eggplant will absorb much of the oil). When the eggplant cubes are starting to look dry and stick to the bottom of the pot, turn down the fire to a low-medium setting. Add the ¼ cup of water, then stir the eggplant cubes quickly and cover the pot. Cook the eggplant cubes for about 10 minutes, stirring occasionally, until the eggplant cubes become soft and translucent. As the eggplant cubes are cooking, prepare the sauce in a small bowl using soy sauce, brown sugar, cider vinegar, water and 2 minced garlic cloves. Stir well together until fully combined. Once drained of excess liquid, crumble the half tofu block using your fingers and set aside in a separate bowl. Pour half the sauce into the crumbled tofu and stir so that all the tofu comes into contact with the sauce. Let the tofu marinate in the sauce for about 5 - 10 minutes. Prepare the remaining ingredients (grated carrot shreds, diced bell pepper and diced green onion stalk) and set aside into one bowl. After the eggplant cubes have cooked for 10 minutes, turn up the stove heat setting again to a ‘medium’ setting. Add the grated carrot shreds and the diced bell pepper. Stir and let cook for 2-3 minutes. Then add the crumbled marinated tofu, diced green onion and the remainder of the sauce into the pot. Cook for another 5 minutes. Meanwhile, in a small bowl mix together 2 teaspoons of corn starch (also known as corn flour) with 2 tablespoons of cold water. Stir well until the corn starch is fully integrated. When all the vegetables are cooked through, turn down the stove heat setting to low-medium, and then add in the cornstarch mixture to the pot. Stir continuously and once the sauce thickens (after a minute or two), turn off the heat setting. Ready to serve! It is important to watch the contents in the saucepan carefully to prevent the eggplant mixture from drying out quickly (add a tablespoon of water at a time to thin out the sauce if needed). Pair this dish with the grain of your choice like rice, couscous, quinoa or barley, noodles or gluten-free alternative. ← Can My 12 To 23-Month-Old Toddler Drink Plant-Based Milks?